Car Detailing In Markham- Wash Me Now. The population of Markham was estimated at over 340,000 in 2015, and it should go without saying that this area is also home to a large number of vehicle owners. Keeping your car clean is not always easy when you lead such a busy lifestyle and daily driving means that your vehicle is sure to require regular cleaning both inside and out. Our service is mobile and will come to you. With Wash Me Now – Car Detailing In Markham, keeping your vehicle in top condition is more convenient than ever. Our experienced team has worked on a wide variety of vehicles including SUVs, family cars, luxury vehicles, and even electric cars. No matter the type of vehicle you own, you can rest assured that we will tend to your vehicle with the utmost care and attention to detail. We go above and beyond to ensure that every auto detailing we perform is completed to perfection. When we detail a car, it goes beyond a simple wash and vacuum. Our skilled team at Wash Me Now takes the time to clean dirt and dust out of every possible nook and cranny. We perform specialized treatments on leather, plastic, and various other materials found throughout the interior and exterior of your vehicle. By the time our team is done, your car will look its absolute best! We have more than 100 5-star reviews from our many satisfied customers. These reviews and our 100% satisfaction guarantee clearly indicate the high level of service we offer. Of course, you need not take our word for it. Read the reviews for yourself and become part of our growing number of happy clients! Time is one of the main factors to consider when it comes to cleaning your car. While a quick wash may only take a few minutes, it’s the finer details that really take time. At Wash Me Now, we provide mobile car detailing in Markham for your convenience. We will come to you anywhere in the area and perform professional detailing while you go about your usual business! We bring all of our own supplies and even our own water! Steam is known for its cleaning and disinfecting properties. Using steam allows us to achieve the best results without any rubbing, scrubbing, or excessive use of water. Both the interior and exterior of your vehicle can benefit from the use of steam cleaning power. Not to mention our environment. 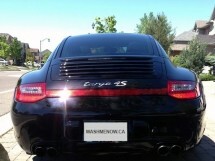 At Wash Me Now, we offer car detailing in Markham at affordable prices. Our competitive prices and various detailing packages make it that much easier for our clients to find the best options to suit their individual needs. Our vehicle detailing plans cater to a wide variety of needs. We understand that our clients need nothing more than a professional exterior clean and, other times, they need the interior of their car to be restored to its former beauty. Apart from our various packages, we also offer several optional extras such as pet hair removal, ozone generator, and headlight restoration. At Wash Me Now, we realize the importance of water conservation and protecting our environment. This is why we use steam cleaning and safe cleaning solutions. All of these steps have been taken in order to provide our customers with the best car detailing in Markham without harming our local surroundings. Given the fast-paced nature of our lives these days, it’s common for vehicle owners to neglect the appearance of their cars. 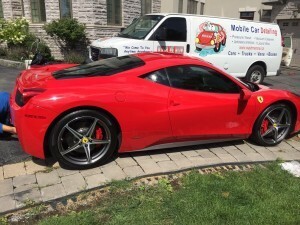 Allocating enough time for a professional car detailing in Markham is often seen as a tall order. This is why our packages each contain comprehensive details regarding the treatments that will be performed as well as the amount of time needed. The size of your vehicle and the detailing package you select will determine the amount of time required to get your car spotlessly clean. Take a look at our options here and feel free to call us for any more information.